The envelope consists of walls, windows, doors, roofs and skylights. It provides separation and protection from outdoor weather conditions. An exposure is the outside surface of a building envelope component. It has an azimuth direction (also known as exposure orientation). The term exposure is not usually applied to intermediate floors and interior partitions. These components can be considered as part of the space envelope but the outside surface is not exposed to the weather. Sometimes the term wall exposure is used to include the entire vertical surface consisting of the wall and also its windows and doors. The term roof exposure is used to include the entire horizontal or tilted surface including the roof and skylights. A building's exterior wall azimuth (also referred to as exposure orientation) is the direction faced by the wall. It is the direction that you are looking at when looking out through the window in the wall from inside the building. 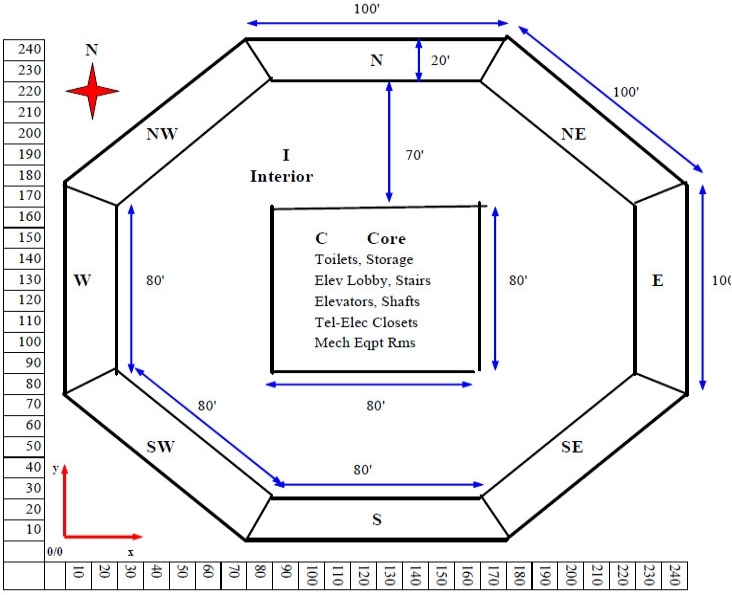 This convention is used later in establishing direction of building surfaces relative to other building surfaces. The tilt angle of a vertical wall is 90o. It is measured from the horizontal which has a tilt angle of 0o. However some walls may be tilted slightly away from the vertical. If this tilt angle is, say, less than 60o then you can treat it as a roof. 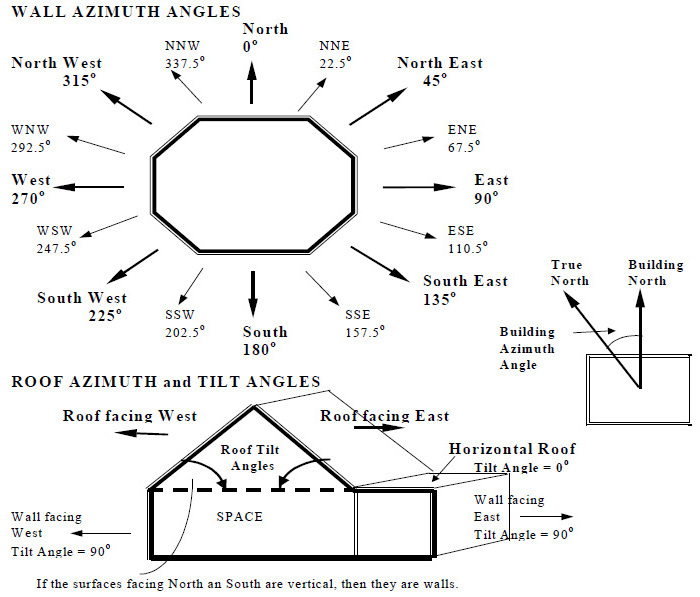 A roof has an azimuth angle and a tilt angle. The roof tilt angle is measured from the horizontal within the enclosed building space. So both the roofs shown in the figure have a tilt angle of 60o. 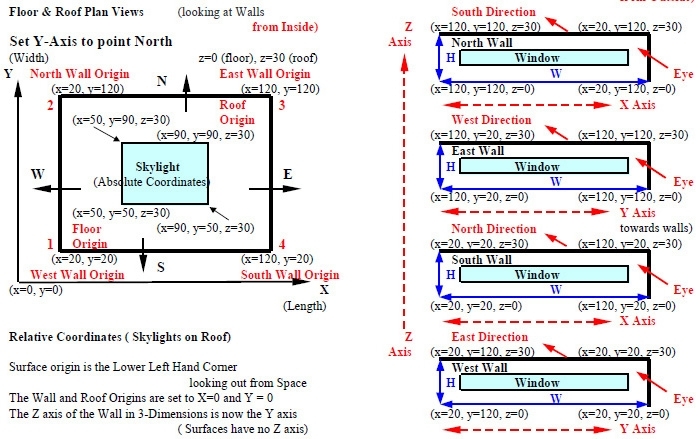 The roof azimuth angle is the azimuth angle of the equivalent wall. For example increase the tilt angle until it is vertical and it is the orientation looking out from inside. A horizontal roof has an azimuth angle of 0o and a tilt angle of 0o. Windows are glass on walls and doors. They are assumed to have the same azimuth (orientation) angle as the wall it is located on. If the window tilt angle is different from that of the wall, then a separate wall with 100% glazing must be defined. Windows are affected by solar radiation and infiltration in addition heat transfer. Overhangs, side fins, canopies, the metal or wood frame are considered as part of the window configuration. Floor on grade (ground) is affected by the ground temperature. About 10 feet below grade the ground temperature can vary between 40oF (above freezing) and 60oF while the outside temperature varies from -40oF to 120oF. Floors: The conditions on either side of an intermediate floor can be the same or it can be different. If they are the same then there is no heat transfer through the floor and the floor can be ignored or omitted in the heat gain/loss calculations. If the conditions are different (example, one side is air-conditioned and the other side is not) then the floor cannot be ignored. Partitions are vertical walls that are not exposed to the outside and are therefore not affected by solar, wind and other weather and environmental conditions. Partitions that separate spaces with similar conditions can be ignored. Partitions that separate spaces with different conditions, such as an air conditioned space and a ventilated space such as a boiler room, must be included in the heat gain loss calculations. The ventilated space can be assumed to be at outdoor air conditions. Ceilings are suspended surfaces below a roof or an intermediate wall. A ceiling is considered an envelope to an air conditioned space because the temperature and humidity conditions above the ceiling can be different from the occupied space. Computer program will calculate the conditions above the ceiling based on light heat to ceiling space, equipment in ceiling space, heat exchange through ceiling from space, return air rates through the ceiling space, etc. Including the ceiling in modeling a space is important since it affects daylighting, required air changes, etc. Interior doors that separate spaces with the same condition can be ignored. If the conditions on either side are different then treat it as a partition. Color and material of the exterior surface can significantly affect the solar heat gain through the wall or roof during summer cooling months. The sun can strike a flat roof in the tropical zones (23.5 degrees south to 23.5 degrees north) at an angle of 90 degrees (sun altitude). The surface will receive the maximum possible solar radiation intensity. The surface temperature of a flat roof covered with black tar (which has a very high absorptance value) that is used to waterproof the roof can reach temperatures of 200oF when the outside temperature is 100oF or less. Some of the heat is released back to the outside air through convection but most of it will be conducted into the conditioned space. The solar heat gain through the roof is high. Walls and roofs with light colored and reflective exterior surfaces can prevent most of the solar radiation striking the surface from entering the conditioned space. A green roof is a term being used to describe roof lawns and gardens. This layer of earth and grass on the roof acts as both insulation against conducted heat gain (summer) and heat loss (winter) with the outside air and as a barrier to solar heat gain in summer. Roof lawns have to be watered and it adds to the weight of the roof. They require additional structural support. The Standard applies to building envelope components that enclose conditioned space (heating, ventilation & air conditioning - cooling) and semi-heated space. It does not apply to unconditioned or ventilated only spaces. A space is considered conditioned if it is heated and ventilated for normal occupancy or if it is air-conditioned (HV&AC). A ventilated only space is not considered conditioned since it is at outdoor conditions. The building envelope requirements are more stringent for conditioned spaces than they are for semi-heated spaces. 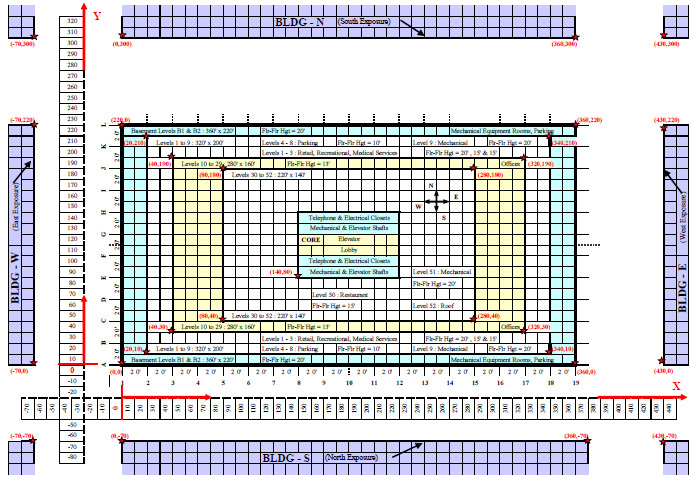 Building envelopes consist of opaque components and fenestration components. Opaque envelope components include walls, roofs, floors, slabs-on-grade, below-gradewalls and opaque doors. Fenestration envelope components (light transmitting areas of walls and roofs) include windows (walls), skylights (roofs) and doors (walls) that are more than 50% glass. An envelope component can be either exterior or semi-exterior. An exterior envelope component separates a conditioned space from outdoor conditions and ventilated (at outdoor air conditions) crawl spaces and attics. Semi exterior envelope components separate conditioned spaces from unconditioned spaces and semi-heated spaces. Semi exterior envelope components also separate semiheated spaces from outdoor conditions. Both non-residential and residential occupied spaces in the U.S. are considered conditioned since they require at least heating for human occupancy. In warmer climates in less developed countries these spaces might be mechanically or naturally ventilated only. The residential space category includes spaces in buildings used primarily for living and sleeping. Examples include, but are not limited to dwelling units, hotel/motel guest rooms, dormitories, nursing homes, patient rooms in hospitals, fraternity / sorority houses, hostels, prisons, fire stations and lodging houses. The buildings have to be low-rise and with limited floor area (up to 10,000 sq.ft.). A ten story hotel with a 1000 units would be considered a commercial building. The non-residential or commercial space category includes all other conditioned spaces including, but not limited to, offices, retail stores, shopping malls, theatres, non-patient rooms in hospitals, restaurants, and convention centers. If the building consists of a mix of residential and nonresidential spaces then the building is non-residential. High rise residential buildings are also considered commercial buildings since they will also contain non-residential spaces and are subject to fire, life-safety and other commercial building codes. Residential spaces are conditioned (by code they must have heating for normal occupancy) on a more-or-less continuous basis. A greater investment and requirement in energy efficiency standards can be justified for spaces that are continuously conditioned, and this is the distinction between the residential and non-residential categories. Note: the HVAC systems of commercial office buildings are turned off during unoccupied hours (evenings and weekends) but the heating systems without ventilation operate at lower night set back temperatures (semi-heated). Examples of semi-heated spaces are warehouses and light manufacturing facilities that have only a limited heating system (no cooling) with lower winter indoor space temperatures. They may or may not have ventilation. Unconditioned spaces have no heating, cooling or ventilation. An example would be a residential garage. Declaring a space as semi-heated or unconditioned must be approved by the building code authority. Some spaces are conditioned even though they may not be heated or cooled. Examples include storage rooms, telephone/electrical closets and small interior toilets rooms adjacent to conditioned spaces. These spaces are conditioned indirectly with transferred air from the conditioned spaces and then exhausted. Spaces such as toilets in perimeter zones will require occupancy level heating and are therefore considered directly conditioned. Storage spaces in perimeter zones might fall under the category of semi-heated spaces (non-occupancy level heating) depending on the type of storage. The ASHRAE Standard 90.1 criteria for fenestration is based on percent fenestration which is Window-Wall Ratio or the Skylight-Roof Ratio. The envelope efficiency requirements are greater for roofs and skylights than they are for walls and windows. The Window-Wall-Ratio is the ratio of fenestration on the walls to the total gross exterior window and wall areas. A window is fenestration with a slope greater than 60 degrees measured from the horizontal. The fenestration area includes non-glass window components such as the frame and sash. The gross exterior window and wall area is based on the horizontally measured exterior wall distance and the vertically measured distance from floor to floor or floor to roof. The Skylight-Roof Ratio is the ratio of skylight area to the total gross exterior skylight and roof area. A skylight is fenestration with a slope less than 60 degrees measured from the horizontal. The skylight area includes the frame and other components of the manufactured assembly. For a flat horizontal roof the area is the plan view area. For sloped roofs it is the total exterior area. 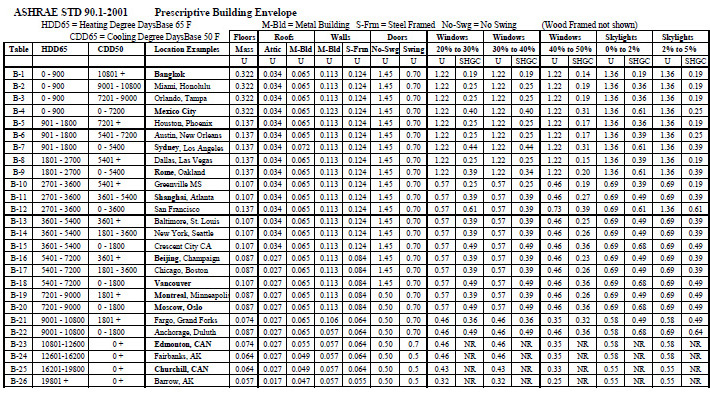 The building envelope standard varies with climatic conditions. The more extreme the summer and winter climate conditions, the more stringent the building envelope thermal performance requirement standard. 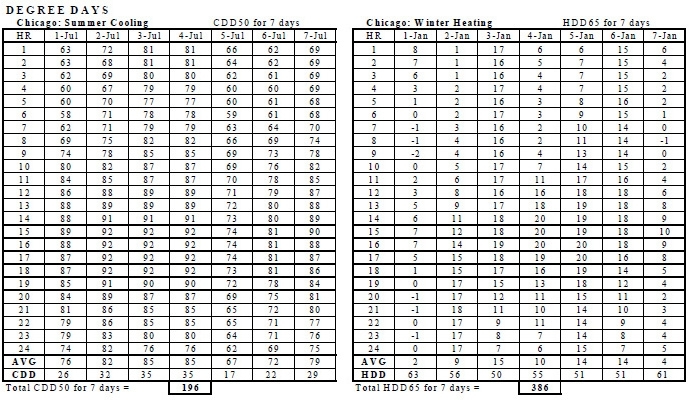 Climate categories of different locations are based on heating and cooling degree days. A degree day is the difference in temperature between the average outdoor air temperature during 24 hours of the day and a given base temperature. 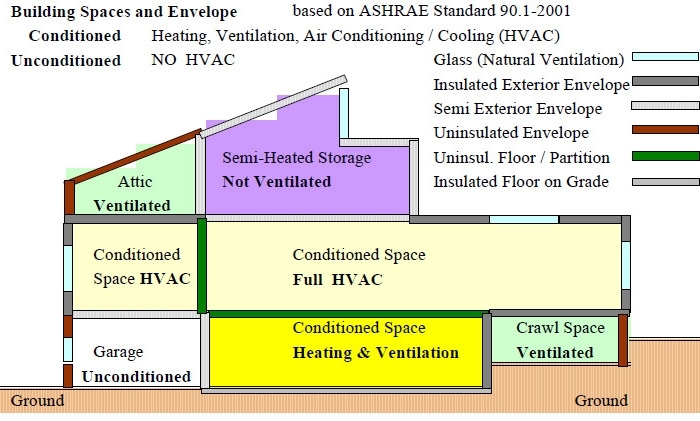 ASHRAE Standard 90 base temperature for determining the number of cooling degree days in a year is 50oF and the base temperature for determining the number of heating degree days in a year is 65oF. The thermal performance requirements of the building envelope are measured with U-factors for opaque components such as walls and roofs and U-factors and Solar Heat Gain Coefficients (SHGC) for fenestration components of windows and skylights. The U-factor is the rate of heat flow (btu/hr) through unit area (1 sq.ft.) of the envelope component when there is one degree temperature difference between the air on each side. Note that the envelope component can have an air films on the surfaces of both sides which affect the overall Ufactor. The U-factor for clear 1/8 inch (0.003 millimeter) thick single glass is 1.1. Solar Heat Gain Coefficients (SHGC) is the ratio of solar radiation that passes through the fenestration to the total solar radiation that falls on the fenestration surface. The SHGC for clear 1/8 inch (0.003 millimeter) thick single glass is 0.86. Shading Coefficient (SC) is the ratio of the solar heat gain (radiation component perpendicular to the surface) through the glass to the solar heat gain through clear 1/8 inch (0.003 millimeter) thick single glass (SC = 1,0). SC compares the given glass with standard glass which is assumed to have an SC = 1.0. 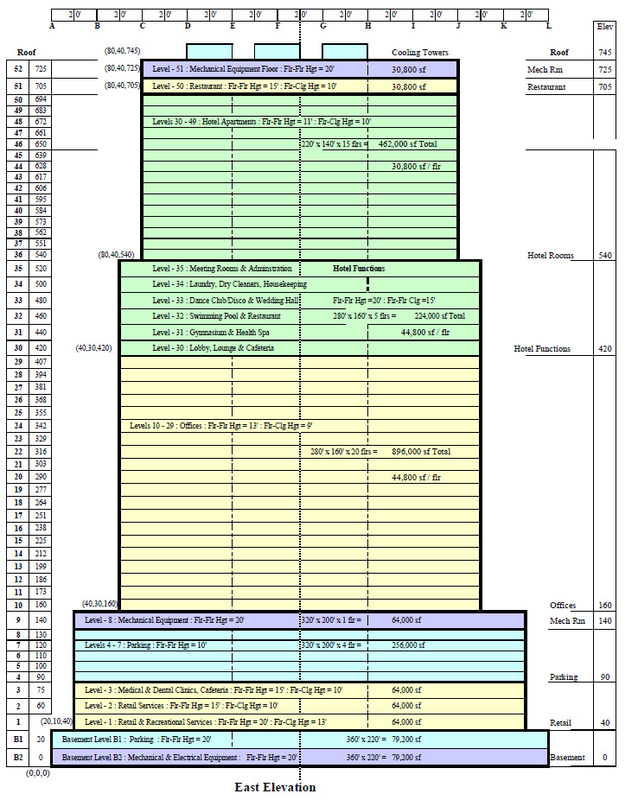 SC = SHGC / 0.86 or SHGC = SC * 0.86 approximately. R-Value is the thermal resistance to heat flow. Insulating ability increases with R-value. 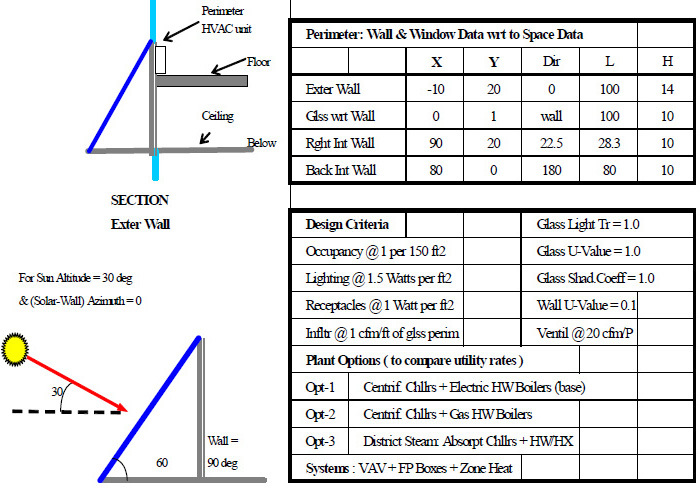 Below is a sample calculation of the overall U-factor of a composite wall. The resistance of each layer material is the reciprocal of the heat transfer coefficient. The above example assumes one dimensional or thermally homogenous flow of heat through the envelope. In other words, the layers of materials at any section through the wall or roof is the same. Heat is transferred from the warm side of the composite envelope to the colder side in a series path materials. No lateral or sideways heat transfer is assumed to take place within the layers. For this to be true, the material in each layer must be continuous and not penetrated by more highly conductive materials. Most common construction has wood or metal studs penetrating the insulation or metal structures breaking the continuity of the insulation. This must be considered when evaluating the overall thermal performance of the envelope. In the case of wood or metal studs the weighted U-value of the envelope can be calculated. Wood studs installed 16 inches on-center comprise 20% to 25% of a typical wall including window framing. Wood studs installed 24 inches on center comprise approximately 15% to 20% of the gross wall surface. This approximation assumes there is no lateral or sideways heat transfer between the studs and the wall layers including insulation. Because the R-value for wood is about 1.0 and for batt insulation is about 3.5, the error can be neglected. Most commercial building construction is metal or steel framed because of economics, structural strength and for fire rating. The conductivity of metal framing is considerably greater than that of the insulation it penetrates. Infrared photography and tests in the laboratory have demonstrated that the thermal performance of this type of envelope is significantly less. The building envelope must be designed to limit the uncontrolled entry of outside air into the building. Air infiltration introduces sensible heat cooling and heating loads and latent heat cooling loads. Controlling infiltration is important to achieving energy efficient buildings. The infiltration rate to be used for the "Prototype" or "Standard" building for comparison with the "Proposed" building according to the International Energy Conservation Code (IECC) 0.3 cfm/sqft of window. According to the Code of Federal Regulations (CFR) it is 0.15 cfm/sqft for fixed windows and 0.37 cfm/sqft for operable windows. ASHRAE Standard 90.1 requires that fenestration products (windows and skylights) have an infiltration rates that are less than 0.4 cfm/sqft. For glazed entrance doors, both revolving and swinging (when closed) it is 1.0 cfm/sqft. Manufacturers must test and rate their products. Vestibules or revolving doors are required for the main entrance doors for buildings taller than four floors in winter climates greater than 1800 HDD65. The distance between the vestibule doors must be at least 7 feet. Vestibules are not required for entrances such as to mechanical rooms, and doors opening directly from a dwelling space or spaces with less than 3000 sqft. 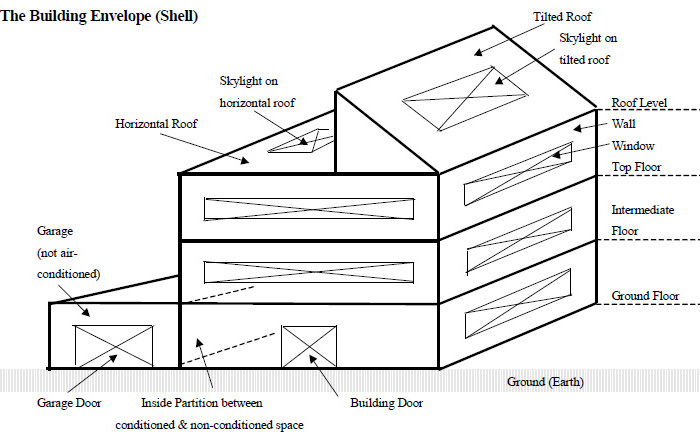 The stack effect, along with wind effects are the main causes of infiltration in high-rise buildings. Window overhangs can reduce summer cooling due to solar heat gains. Overhangs must be a permanent and fixed part of the building structure before credits can be applied to the fenestration. ASHRAE Standard 90.1 credits overhangs by allowing an adjustment to the SHGC of the window fenestration. The size and configuration of the overhang is determined by the Projection Factor (PF). 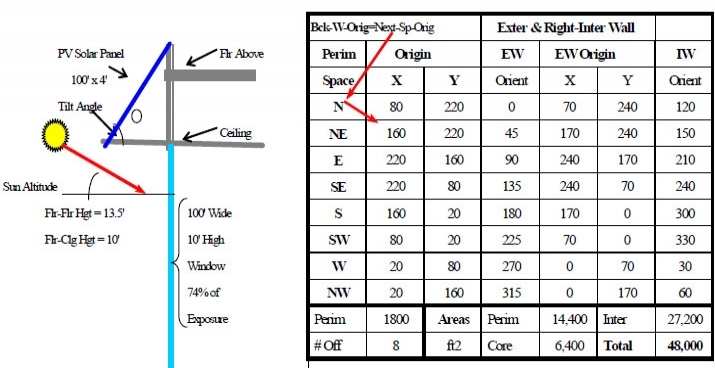 PF is the ratio of the overhang projection measured horizontally to the distance between the window sill (bottom of the window) to the bottom of the overhang.